Allergic Contact Dermatitis, also known Allergic Contact Eczema, is caused by the skin reacting when it comes into contact with an allergen. An allergen is a normally harmless substance to most people. In some people it can cause the immune system to over react and an allergy is formed. This happens when the skin has previously come into contact with the allergen a number of times. The allergic reaction doesn't happen with the first contact. This makes it different to Irritant Contact Dermatitis as this can appear very quickly. 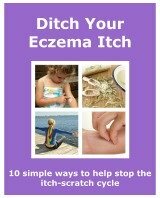 It is also different to Atopic Eczema. This tends to be a genetic condition and allergies can make the symptoms worse. The skin affected will be where the contact happened. These are theareas of the body that come into contact with allergens the most. Usually hands, feet, face and underarms. The symptoms can take from a few hours to a few days to appear. This can make it harder to work out what the cause is. There are many possible causes. An extensive list would be extremely long. Over a short period of time you should find it easier to identify what creates the problem. A pattern will emerge. What you use and when. You come into contact with so many different substances throughout the day. It is an idea to work out what things it could be. In the morning it could be your bathroom routine. What you wash with. What jewellery you wear. During the day you could look at what your job entails. Do you have to wash your hands a lot? Do you wear latex gloves? In the evening, you can look at your hobbies. What chemicals or solvents you use. Also what you use when cooking your meal. Do you use metal or plastic utensils? You could go years and not be affected by a certain allergen, then suddenly a reaction happens. Children do suffer from it but it is uncommon. This is because they haven't had contact with allergens enough times for them to become an allergy. Prevention is the best way to manage allergic contact dermatitis. You could keep a diary of products used and when. But as a reaction can be delayed it can be difficult to work out what the problem is. Allergy testing can be done to see which substances cause a reaction and which don’t. It is usually done by Patch Testing. It is often done by a dermatologist (skin specialist) after you have been referred by your doctor. I suffer from allergic contact dermatitis. One of the things that I get a skin reaction from is nickel. Mainly from the studs on my jeans and from a belt buckle. It took me a while to realise that is was the metal causing the problem. I tried putting a plaster over the back of the stud and stopped wearing a belt. The plaster kept coming off at the edges. It ended up sticking to me. I gave up, and stopped wearing jeans for a while. Then someone told me that if I put clear nail varnish on the metal, it would stop the reaction. I put it on the back of the stud and on the belt buckle. After the day was through my skin wasn't red and itchy. No rash present. Don’t know why it worked but I was so pleased it did.